Buying a speaker, you have to decide what’s important to you. There are so many available you can pretty much be as picky as you like. Well these small square speakers are eco-friendly and you can either choose one of the ones already available or have one customized. They’re a simple set of speakers, but they’re more than enough to make sure that your music stays up and going. 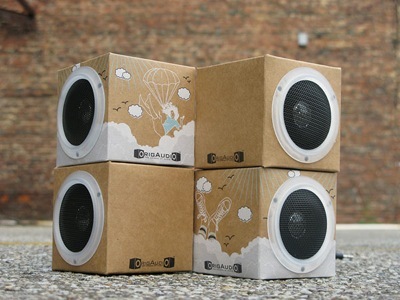 Each one of these foldable speakers comes with a design printed on them. You can have your logo printed onto one for some cheap advertisement or just use one of the several already available. Upon purchasing you’ll receive two 1 watt speakers made from recycled materials. These can be purchased in squares and triangles and are collapsible for travelers. You can purchase one of these self-powered speakers for around $19.99. These speakers are made from cardboard,will be crushed in a week, and are most certainly not ‘eco-friendly’.